MOUNTAIN VIEW, CA AND ANN ARBOR, MI, USA – May 31, 2018 – Health Level Seven International (HL7), the global authority for interoperability in healthcare information technology (IT), and Web3D Consortium (Web3D), the international organization for the delivery and integration of 3D standards between applications and web services, have partnered to cooperatively build cohesive standards to support Web-based 3D visualization of health data. HL7 and Web3D standards complement each other, each addressing different problems to meet the needs of data management, visualization, and analysis of health data. This Statement of Understanding enables HL7 and Web3D members to collaborate across their respective Working Group development activities and vote on ballot items. The goal is to integrate Web3D’s Extensible 3D (X3D®) and Humanoid Animation (HAnim) standards within the HL7 framework to improve the 3D visualization and archiving of health data. The two groups met at the HL7 Working Group Meeting January 2018 in New Orleans to discuss the strengths of X3D as a 3D presentation system for HL7 standards and how to integrate other HL7 standards like Fast Healthcare Interoperability Resources (FHIR®). X3D is crucially positioned as the stable, open standard for 3D data portrayal across several domains. The purpose of this partnership is to improve the interchange of health data and 3D Web portrayal services to support both patient and provider in the healthcare industry. The continuing progress of X3D as a standard for 3D presentation in W3C (HTML5) has sparked broad interest in the industry. Web3D is also an active participant in DICOM’s Working Group 17 to potentially incorporate X3D into the DICOM specification as a 3D payload. X3D is the only open, royalty-free and ISO/IEC-19775-1 certified technology available today for interactive 3D graphics on the web. The use of X3D (http://www.web3d.org/x3d) has increased steadily in systems throughout the world, delivering durable applications in design, GIS, medicine, and entertainment. “We are thrilled about this new relationship with HL7. We are constantly working towards converging with other industry standards to improve 3D portrayal in many domains. Cooperation among our organizations brings a huge value to our members and strengthens our technologies. From imaging to informatics, our mutual goals of data and visualization interoperability will improve outcomes and efficiencies across human health,” said Nicholas Polys, Ph.D., Web3D Consortium President. The Web3D Consortium is a non-profit, international standards organization that originally spearheaded the development of the Virtual Reality Modeling Language (VRML 97) specifications. Today, the Web3D Consortium is utilizing its broad-based industry support to continue developing the X3D® specification, for communicating 3D on the Web, between applications and across distributed networks and web services. 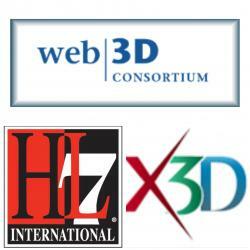 Through well-coordinated efforts with the ISO, W3C, DICOM, OGC and now HL7, the Web3D Consortium is maintaining and extending its standardization activities. Visit the Web3D Consortium at http://www.web3d.org.